With Queen Elizabeth II currently in residence at her Scottish retreat, Balmoral Castle, I thought now would be the perfect time to take a look at a piece of crown jewelry we've not discussed here thus far: the Crown of Scotland. 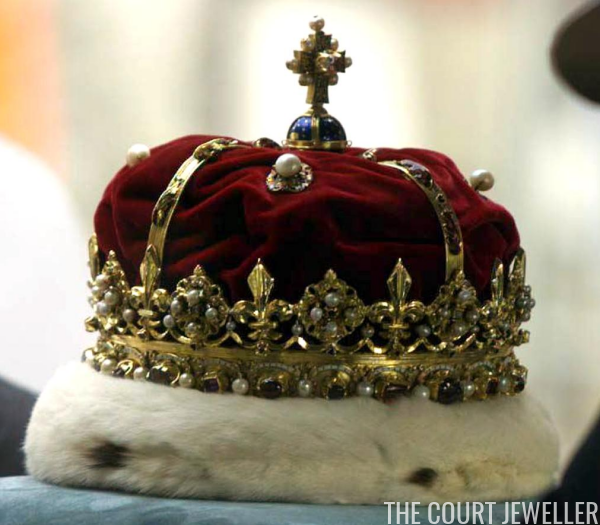 The crown is currently the oldest existing piece of crown jewelry in Britain. The current crown was made by Scotland's royal goldsmith, John Mosman, in 1540, but the materials used to make the crown were recycled from an even older state crown. The base of the piece is made of solid gold, featuring alternating fleur-de-lis and strawberry leaf elements studded with pearls. Four gold arches rise to meet at an orb, called a "monde" because it represents the world over which the monarch reigns, which is painted blue and decorated with stars. The monde is topped with a gold and enamel cross which is also decorated with pearls. 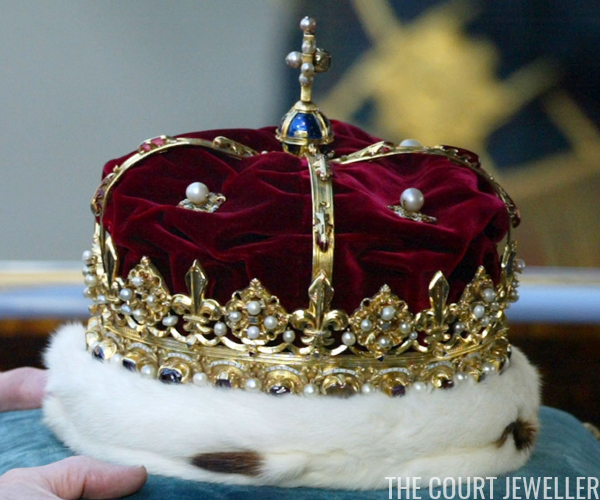 The crown is also studded with additional gemstones, including garnets and amethysts. The pearls on the crown are, appropriately, Scottish freshwater pearls. Like many crowns, the Crown of Scotland includes a cap, or "bonnet," made of velvet and ermine. The velvet portion of that bonnet was originally purple, but James II and VII ordered that the color be changed to red. 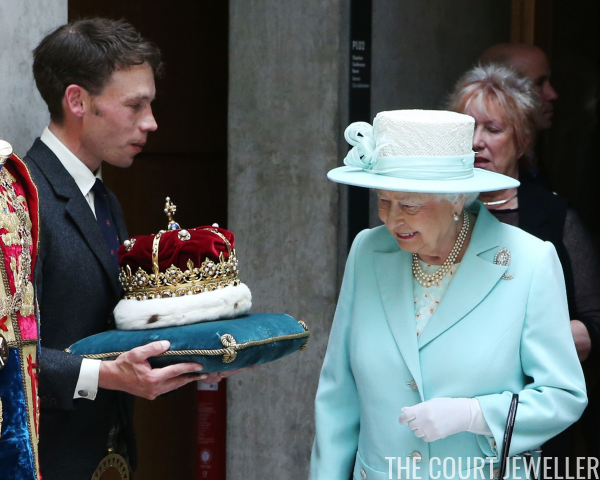 The crown still features a red velvet cap today. 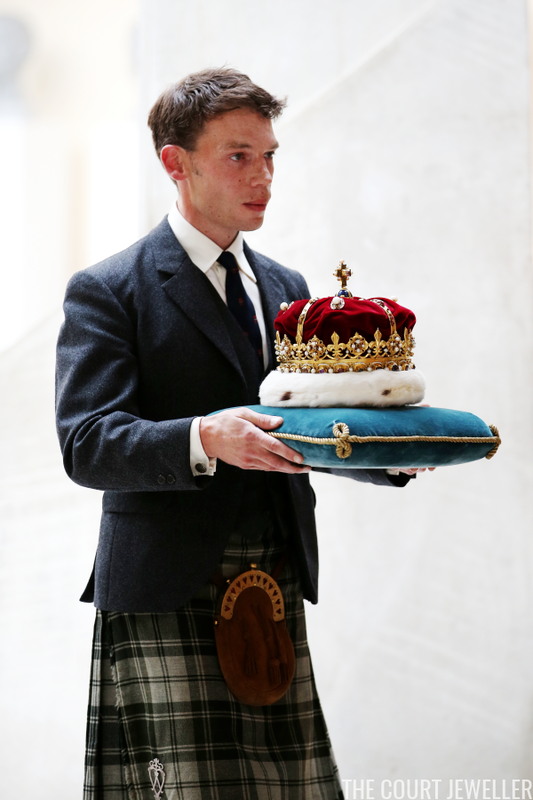 The crown has been used at Scottish coronations since the 16th century. 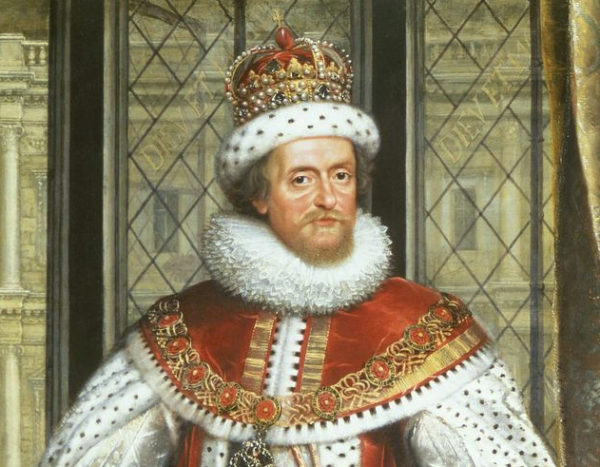 The first monarch to wear the crown was King James V, who donned the crown during the coronation of his second wife, Marie de Guise, in 1540. The crown has either been worn at or present during the coronations of several other Scottish monarchs, including Mary, Queen of Scots (1543), James I and VI (1567), Charles I (1633), and Charles II (1651). During the interregnum period in Britain, when Oliver Cromwell was the leader of the land, the Scottish crown jewels were hidden. Cromwell reportedly wanted to destroy the collection, just as he had done in England, but the crown, sword, and sceptre were successfully buried out of sight before they could be dismantled. When Scotland officially joined England to form Great Britain, the crown was locked away once more, this time in Edinburgh Castle. There the crown was hidden for more than a century, until the novelist Sir Walter Scott led a push in 1818 to try to find its whereabouts. Four years later, the crown was presented to King George IV at the Palace of Holyroodhouse during his landmark visit to Scotland. Today, the crown resides in Edinburgh Castle, where it is on display in the Crown Room, but it is sometimes brought out for special occasions. Most of these are ceremonies related to the Scottish parliament, including the annual opening of parliament. It is always carried by the Duke of Hamilton, who holds the positions of "Hereditary Crown Bearer" and "Hereditary Keeper of Holyroodhouse." The occupant of that position is 39-year-old Alexander Douglas-Hamilton, 16th Duke of Hamilton and 13th Duke of Brandon.